Disposable respiratory masks are a critical safety item for many different situations, and getting the correct model is crucial. We offer three top rated brands - 3M, Honeywell, and Moldex - and we are adding more brands to increase the options for customers. Whether you need a simple, inexpensive, non-rated dust mask, or one that is rated for oil-laden environments with organic vapors such as paint thinner, or welding environments carrying acid gasses, we have just what you need. If you need help choosing, we have a number of product guides in the pages below, and of course, our helpful staff are available to assist you via chat (in the lower right corner of your screen), email us at info@earplugstore.com, or phone us at 918-478-5500. We are here to help. This R95 respirator provides at least 95% filtration efficiency against both oil and non-oil based particulate. For relief from latex paint odor or non-hazardous household odors, and protection for drywall, particle board, or fiberglass installation. Also a good choice for smog. Honeywell Economy Nuisance Dust Masks are the ideal solution when you need basic respiratory protection from dust and pollen. Inexpensive; not rated. A highly economical dust mask. The 3M 8210 Plus Pro is NIOSH-approved to provide 95% filtration efficiency against both solid and liquid non-oil based particulate. This is the same as the 8210 Plus respirator, but packaged for store front sales. The 3M 8511 Pro N95 provides at least 95% filtration efficiency against non-oil based particulate. This respirator features a spacious cup design and is durable even in heat and humidity. Braided headbands and Cool Flow valve. Packaged for store front sales. 33M 8200 N95 particulate respirators provide 95% filtration efficiency against non-oil based particulate. This is a classic, highly economical disposable respirator. Lightweight and inexpensive. Honeywell SAF-T-FIT Plus N1135 Respirators provide 99.97% efficiency in protecting against both oil and non oil based particulate. Premium respirator; highest protection. Features an exhalation valve, full face seal, nose clip, and adjustable straps. The 3M 8210V is NIOSH-approved to provide 95% filtration efficiency against both solid and liquid non-oil based particulate. Offers all the features of the 8210, with the addition of a Cool Flow valve. (N95/FFP2) DeltaPlus M1200V is a high quality N95/FFP2 disposable respirator mask with exhalation valve, dual self-adjusting straps, metal nose clip, and nose pad, for increased comfort. (N95/FFP2) DeltaPlus M1200 is a value-priced high quality N95/FFP2 disposable respirator mask, with dual adjustable straps, metal nose clip, and nose pad, for increased comfort. (N99/FFP3) DeltaPlus M1300V is a full-featured N99/FFP3 disposable respirator mask, with exhalation valve, wide, adjustable straps, full face joint ring and metal nose clip. Honeywell ONE-FIT NBW95 N95 particulate respirator masks reduce non-oil particulate with 95% filtration efficiency. Features a sturdy cup shape with a molded nose bridge and no metal nose clip, plus an exhalation valve. A highly economical particulate respirator. One size fits a wide range of face shapes and sizes. The 3M 8210 is NIOSH-approved to provide 95% filtration efficiency against both solid and liquid non-oil based particulate. The baseline model in the 8210 series of disposable respirators. Honeywell ONE-FIT NBW95 N95 particulate respirator masks reduce non-oil particulate with 95% filtration efficiency. Features a sturdy cup shape with a molded nose bridge and no metal nose clip. A highly economical particulate respirator. One size fits a wide range of face shapes and sizes. The 3M 8210 Plus is NIOSH-approved to provide 95% filtration efficiency against both solid and liquid non-oil based particulate. Offers all the features of the 8210, but with braided cloth comfort straps. Moldex 4200 masks are part of the exclusive Moldex AirWave line of high breathability respirators. These masks outperform other unvalved respirators for significantly less with than a valved mask costs. The 3M 8110S is NIOSH-approved to provide 95% filtration efficiency against non-oil based particulate. This is a classic, highly economical disposable respirator just like the 8210, but in a smaller size to fit smaller faces. The 3M 8511 N95 provides at least 95% filtration efficiency against non-oil based particulate. This respirator features a spacious cup design and is durable even in heat and humidity. Braided headbands and Cool Flow valve. Moldex 2730 Disposable Respirators provide 99.97% efficiency in protecting against non oil based particulate. These masks feature the exclusive Ventex Valve which releases exhaled heat easily, with less breathing resistance, keeping workers cooler. Honeywell SAF-T-FIT Plus N1105 Respirators provide 95% efficiency in protecting against non oil based particulate. Economy respirator. Features a nose clip. (N95+OV/FFP2) DeltaPlus M1200VW is a high quality N95+OV/FFP2 disposable respirator mask with exhalation Valve, dual self-adjusting straps, metal nose clip, and nose pad, for increased comfort. The 3M 8233 N100 provides NIOSH's highest rated filtration efficiency (99.97%) against non-oil based particulate. For lead abatement, pharmaceutical manufacturing, welding, and working around substance specific regulated particles including lead, cadmium, and arsenic. Honeywell SAF-T-FIT Plus N1115 Respirators provide 95% efficiency in protecting against non oil based particulate. Features nose seal and nose clip. Moldex 2360 disposable respirators feature premium 99.97% efficiency against both oil and non oil based particulates. These respirators feature the exclusive Ventex Valve, which releases heat and lowers breathing resistance. The 3M 8240 provides at least 95% filtration efficiency against both oil and non-oil based particulate. This classic style respirator is an economical choice for environments in which oil aerosols are present. The 3M 8293 P95 provides at least 95% filtration efficiency against both oil and non-oil based particulate. Features 3M's Cool Flow valve to keep workers cool and fully adjustable straps for a secure fit and improved comfort. Honeywell ONE-FIT HC-NB295F respirators are designed for medical applications. Reduces the transfer of airborne microorganisms and other particulates. Provides sufficient protection against pandemic diseases including H1N1, Avian Flu, and SARS. The 3M 9105S provides 95% filtration efficiency against non-oil based particulate. This extremely economical respirator features unique v-shaped pleats that flex with mouth movements and increase surface area for easy breathing. Small size. The 3M 9105 provides 95% filtration efficiency against non-oil based particulate. This extremely economical respirator features unique v-shaped pleats that flex with mouth movements and increase surface area for easy breathing. Regular size. The 3M 8233q is for quantitative fit testing only. Must NOT be used for protection in any contaminated area. Features adjustable buckle straps and faceseal. Probed. Individually wrapped. Moldex 2600 disposable respirators provide 95% efficiency against non-oil based particulate. Instead of a metal noseband, which requires uncomfortable adjustments, they feature a contoured nose bridge with a soft foam nose cushion. The 8515 N95 provides at least 95% filtration efficiency against non-oil based particulate. This is a highly economical disposable respirator for welding. Features Cool Flow valve. Moldex 2200 disposable respirators provide 95% efficiency against non-oil based particulate. These masks have no metal noseband to pinch and no pressure points to irritate, making them comfortable to wear. Moldex 2310 disposable respirators are suitable for most welding applications, as well as other dusty work where no oil is present. These respirators feature a Button Valve to keep the mask cooler and increase breathability. Moldex 2300 Disposable Respirators provide 95% efficiency in protecting against non oil based particulate. Suitable for welding, these vented disposable respirators are excellent for hot and humid environments. The 3M 8211 provides 95% or better filtration efficiency against non-oil based particles. The cup design makes this respirator more spacious to wear and more durable in hot and humid conditions. Features Cool Flow valve. The Moldex 4700 disposable respirator provides 99.97% efficiency against non-oil particulate. 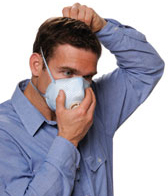 Moldex 4700 masks are part of the exclusive Moldex AirWave line of high breathability respirators. The Moldex Special Ops M2600 comes in a solid black color that stays cleaner looking for longer. Moldex 2600 disposable respirators provide 95% efficiency against non-oil based particulate. Moldex EZ-ON® Particulate Respirators have a single adjustable strap for a quick and easy fit. This single strap has a Flexwing® and a head harness, which together make for a better, more comfortable fit than the standard two strap design. The Moldex 2200 HV N95 disposable respirator features Moldex's bright green color for hi-vis protection and easy compliance checks. These respirators stand out clearly. The 3M 8271 P95 provides at least 95% filtration efficiency against both oil and non-oil based particulate. This respirator features an improved foam faceseal, spacious cup design, and remains durable even in heat and humidity. Moldex 2315 disposable respirators feature premium 99% or great efficiency, giving them excellent protection against most welding fumes. These respirators feature an Exhale Valve to decrease breathing resistance and keep workers cool. Honeywell SAF-T-FIT Plus N1139 Respirators provide 99% efficiency in protecting against non oil based particulate. Premium respirator. Features an exhalation valve, full face seal, nose clip, and adjustable straps. Honeywell SAF-T-FIT Plus N1135 Respirators provide 95% efficiency in protecting against both oil and non oil based particulate. Premium respirator. Features an exhalation valve, full face seal, nose clip, and adjustable straps. Moldex 2700 Disposable Respirators provide 95% efficiency in protecting against non oil based particulate. These masks feature the exclusive Ventex Valve which releases exhaled heat easily, with less breathing resistance, keeping workers cooler. The 3M 8516 N95 provides at least 95% filtration efficiency against non-oil based particulate. This is a highly economical disposable respirator for welding. Provides relief from nuisance levels of acid gasses. Features Cool Flow valve. Moldex EZ-ON® Particulate Respirators have a single adjustable strap for a quick and easy fit. This single strap has a Flexwing® and a head harness, which together make for a better, more comfortable fit than the standard two strap design. Features Ventex Valve. The Moldex 4300 P95 disposable respirator is a P-type mask, which provides 95% protection against both oil and non-oil based particulate. Moldex 4300 masks are part of the exclusive Moldex AirWave line of high breathability respirators. Moldex 1200 Dirt Dawgs® disposable respirators stand up to tough conditions. Their Dura-Mesh® shell makes them more resilient in the face of heat and humidity, and it also stays cleaner-looking longer. This is the black Special Ops version of the standard Moldex 2700 N95 disposable respirator. Moldex 2700 Disposable Respirators provide 95% efficiency in protecting against non oil based particulate. Moldex 2740 Disposable Respirators provide 95% efficiency in protecting against both oil and non oil based particulate. These masks feature the exclusive Ventex Valve which releases exhaled heat easily, with less breathing resistance, keeping workers cooler. The 3M 8576 P95 provides at least 95% filtration efficiency against both oil and non-oil based particulate. Provides relief from nuisance levels of acid gas. Features spacious cup design, and is durable even in heat and humidity. Adjustable headbands and 3M Cool Flow valve. Honeywell SAF-T-FIT Plus N1125-OV Respirators provide 95% efficiency in protecting against non oil based particulate, plus relief from nuisance organic vapor. Features an exhalation valve, nose seal and nose clip. The 3M 8577 P95 provides at least 95% filtration efficiency against both oil and non-oil based particulate. Provides relief from nuisance levels of ozone/organic vapors. Features spacious cup design, and is durable even in heat and humidity. Adjustable headbands and 3M Cool Flow valve. Honeywell SAF-T-FIT Plus N1125-AG Respirators provide 95% efficiency in protecting against non oil based particulate, plus relief from nuisance acid gas. Features an exhalation valve, nose seal and nose clip. Honeywell SAF-T-FIT Plus N1125 Respirators provide 95% efficiency in protecting against non oil based particulate. Features an exhalation valve, nose seal and nose clip. This is the sleek black Special Ops version of the Moldex 2740 disposable respirator. Moldex M2740 Disposable Respirators provide 95% efficiency in protecting against both oil and non oil based particulate. This is the Special Ops version of the Moldex 2740 disposable respirator. Moldex M2740 Disposable Respirators provide 95% efficiency in protecting against both oil and non oil based particulate. Moldex 2400 Disposable Respirators provide 95% efficiency in protecting against non oil based particulate, plus an added carbon layer to filter out nuisance levels (less than OSHA PEL) of ozone and organic vapors. The 3M 8246 provides at least 95% filtration efficiency against non-oil based particulate. Classic style respirator for use with both non-oil and oil based particulate. Provides relief from nuisance levels ozone/organic vapors. The 3M 8246 provides at least 95% filtration efficiency against non-oil based particulate. Classic style respirator for use with both non-oil and oil based particulate. Provides relief from nuisance levels of acid gasses. Moldex 2500 Disposable Respirators provide 95% efficiency in protecting against non oil based particulate, plus added sorbent to filter out nuisance levels (less than OSHA Permissible Exposure Limit) of acid gas irritants. Moldex 2800 Disposable Respirators provide 95% efficiency in protecting against non oil based particulate. They also have an added carbon layer to protect workers against nuisance levels (less than OSHA PEL) of ozone and organic vapor odors. The 3M 8512 N95 provides at least 95% filtration efficiency against non-oil based particulate. This disposable respirator is designed for welding applications. Adjustable 4-point headband. Heat resistant with a Cool Flow valve. The 3M 8212 provides at least 95% filtration efficency against non-oil based particulate. This disposable respirator is designed for welding applications. Heat resistant with a Cool Flow valve. Moldex 2840 Disposable Respirators provide 95% efficiency in protecting against both oil and non oil based particulate. They also have an added carbon layer to protect workers against nuisance levels (less than OSHA PEL) of ozone and organic vapor odors. This is the sleek black Special Operations version of the Moldex 2800 disposable respirator. Moldex M2800 Disposable Respirators provide 95% efficiency in protecting against non oil based particulate + nuisance OV/ozone relief. Moldex 2940 Disposable Respirators provide 95% efficiency in protecting against both oil and non oil based particulate. They also have added sorbent to protect workers against nuisance levels (less than OSHA PEL) of acid gas irritants. The 3M 8514 N95 provides at least 95% filtration efficiency against non-oil based particulate. This disposable respirator is designed for welding applications. Provides relief from nuisance levels of ozone/oranic vapors. Adjustable headbands. Heat resistant with a Cool Flow valve. This is the sleek black Special Ops version of the Moldex 2840 disposable respirator. Moldex M2840 Disposable Respirators provide 95% efficiency in protecting against both oil and non oil based particulate + nuisance OV/ozone relief. The 3M 8214 provides at least 95% filtration efficency against non-oil based particulate. This disposable respirator is designed for welding. Provides relief from nuisance levels of ozone/oranic vapors. Heat resistant with a Cool Flow valve.